THIS MORNING, Doris Lessing won the Nobel Prize for Literature. A little over a year or ago I visited her in her tall, narrow, shambling North London home on a cold winter day and talked to her of literature and the world and her (then) new book, "The Story of General Dann and Mara's Daughter, Griot and the Snow Dog." The driver who took me there was very familiar with Mrs. Lessing, as he called her, and seemed to feel a sort of protective pride in taking so many visitors to and from her house. Lessing came to the door herself, dressed in a sweater and long skirt, and led me upstairs to her study, a large open room which faced the front street. We sat on a low couch, with the tape recorder resting on a bookshelf within arm's reach, crammed with titles like Tom Holland's Persian Fire, and other titles. "I'll get to them someday," she said. We talked for roughly an hour and a half. Here is a Q&A version of that interview, in which she discussed her cult status as a science fiction writer, the book everyone asks her about, how she occasionally works out kinks in plot in her dreams, and how fiction envisions the future. FOR OVER 25 years, Doris Lessing has lived in a small row house in a North London neighborhood that abuts the cemetery where Sigmund Freud is buried. Each morning, the 87-year-old author of the best-seller "The Golden Notebook" rises at 5 a.m. and feeds several hundred birds. She then returns home, makes breakfast and is usually at her desk by 9, where she writes because, as she puts it in her plain and simple terms, "it is what I do." Last year, on a bitterly cold afternoon, the beginning of what many meteorologists warned was going to be England's coldest winter in years, Lessing agreed to sit down and speak about her recent novel, "The Story of General Dann and Mara's Daughter, Griot and the Snow Dog." The book is set in a future ice age and carries its hero forward from "Mara & Dann" (1999), in which Dann and his sister escaped a terrible drought in Africa. Q: It's tempting to read this novel -- as with all speculative fiction -- as a parable of our times. But you have resisted this instinct in the past. Do you still feel that way? A: Yes. You see, I wrote a book called "Mara & Dann," and I really became concerned with poor Dann. Some people hated him. He instigated such violence. But I was interested in Dann, so I wanted to write a sequel. I realized it would have to be in that semi-drowned world. I don't find it hard to imagine landscapes. See, the whole of "Mara & Dann" takes place during a drought, which I had just been watching in Africa. My son John and a coffee farmer had been there. Have you ever been in a drought? Well, it's hard. People are dying and their water is drying up and the trees are dead, and it's absolutely horrible. I didn't have to imagine that. Q: The descriptions of the refugees Dann encounters reminded me of your book about visiting Afghanistan in the '80s, seeing the refugees fleeing into Peshawar. A: You know, it never occurred to me until afterwards that everybody in these books is a refugee. But everyone is running from drought or flood or civil war. I do think a lot about them. You know, not far from here is a road where refugees of all kinds line the roads, and people go there to pick up a plumber or carpenter or something. This isn't an official thing, you know, but there they are. A friend of mine goes there when she wants anything. They are all very skilled people. Q: When you first came to London in 1949, was it like that? A: No, what was happening then was everyone I met had been a soldier or in the navy or something like that, so people talked about war all the time. And they talked about the war until somewhere in the mid-'50s. Then what happened, there was a new generation popping up. They were a new generation and they weren't interested. Suddenly, nobody talked about the war. I found that painful in a way. Now I think you can't spend all your life possessed by a terrible past, can you? Q: It's strange, for it seems like back then some people responded to this devastation by believing in an idea: communism. But now no one has any ideology outside of religion. A: No one believes in anything anymore. You know, we've seen several TV films now about the ferment over the Vietnam War. And we look at this and think, this is America. What's happened to it now? Q: Have you ever wanted to write a romance? A: Well, you know you can't write them cynically. I know a man who did it. He happened to be a very committed socialist. And he said, "You have to remember, Doris, you can't write these things laughing. Thank God I've got this vein of sentimentality." He did very well out of them. Q: When you began publishing in the 1950s, switching between naturalistic fiction and so-called genre fiction wasn't very common, was it? A: No, and now all the boundaries are blurred. When I was starting out, science fiction was a little genre over there, which only a few people read. But now -- where are you going to put, for example, Salman Rushdie? Or any of the South American writers? Most people get by calling them magical realists. Q: You've written many novels. Are there any you wish people would read more? A: My science fiction books. "Canopus in Argos" had a great readership way back when, and it even started a religion. "Shikasta" (the first in the series) was taken literally and they started up a commune in America. They wrote to me and said, "When are we going to be visited by the gods?" And I wrote back, and said, "Look, this is not a cosmology, this is an invention." And they wrote back and said, "Ah, you are just testing us." Q: I can't imagine that happening today. A: Well, it was different back then. I used to go to San Francisco quite a lot. I was there before a big audience once, and a man gets up and says, "Doris, I hope you are not going to write any of your dreary realistic novels," and then another person got up and said, "Doris, I hope you aren't going to waste any more time with those silly science fiction novels." And they got the whole crowd arguing. I can't imagine that happening today. Q: Do you believe that the cultural revolution of the '60s went too far? A: Well, the hard drugs didn't reach here then. It was just marijuana. Also the so-called sexual revolution I always have great difficulty in understanding -- because it sounds like there wasn't a sexual revolution before that. In wartime, people screw! So I find what's wrong about the '60s is it's an aftermath of (World War II). I think there were so many screwed-up kids. Why were they? They never had it so good. Ever. I remember one of their leaders sort of spoke up and said, rather bravely: "You think you have something special going. But you don't. You're the first market of young people in the world. That's why you are so privileged." He took a lot of abuse for saying that, but I think he was right. Q: Why do you think "The Golden Notebook" was so popular? A: I think in part because it was the first book that had feminist ideas in it, but also I was writing out of enormous energy at the time. It was the late '50s and my whole personal life was in turmoil, and communism was shredding before your eyes, and all that went into my book. The energy in that book is, I'm sure, why it goes on. Q: Well, "The Story of General Dann" has quite a bit of energy in it, and you are 86. A: But I'm not challenging any ideas in it. Nobody is going to believe this, but when I wrote "The Golden Notebook," I had no idea I was writing a feminist book. Because I had been putting into it the sort of thing women had been saying in their kitchen. But something said doesn't have the effect of something written. People behaved as if I had done something amazing, yet I just wrote down what women were saying. Q: Speaking of that -- in one of your previous interviews you described the fact that the threat of another ice age would make a nuclear threat seem like a puppy. Is this novel a warning? A: Well, I do think about that, because we've had many ice ages, and we are certainly going to have another one. What pains me is that everything the human race has created has happened in the last 10,000 years, you know, and most of it in the recent years. An ice age would just wipe that out. It would. Then we have to begin again then, don't we, which is what we always do. 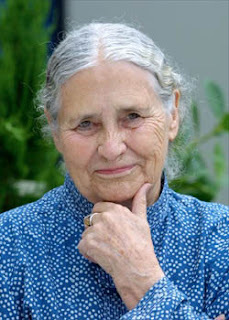 "Doris Lessing Wins Nobel" was posted October 11, 2007.